This Pyreneean mountain valley in northwest Catalonia is a fisherman’s delight. When we finally left Andorra, we headed south into Spain, where we drove up and down mountainsides, through crowded little villages, and past Catalonia’s only national park: Aigues Tortes. No roads run through the park, though there is a network of jeep tracks. Izards, wild boar, stoats, and the extremely rare desman (something like a long-nosed mole that swims) all live in the park, though by most accounts they are very tough to spot. We contented ourselves with walking along the long, narrow fishing lake of Panta de la Torrassa and stopped at the height of a pass—the Port de la Bonaigua—where we saw our first snowcapped peaks. 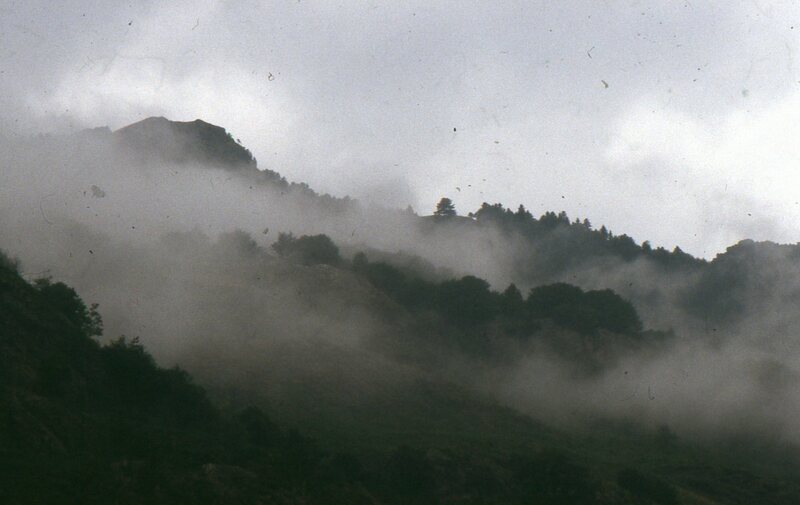 Fog tendrils swirl around a misty mountaintop in Spain’s Aran Valley. Then it was down into the Val d’Aran, long considered the most remote part of Spain. Most of the Pyrenees are divided at the crestline and watersheds between France and Spain, but in 1312 the Aran Valley was allowed to choose their allegiance in a public referendum. Their river (the tiny Garona, which becomes the great Garonne in France and winds through Bordeaux and on into the Atlantic) flows north to France, but they chose to ally with Spain, in the hopes that it would mean less interference in their lives. 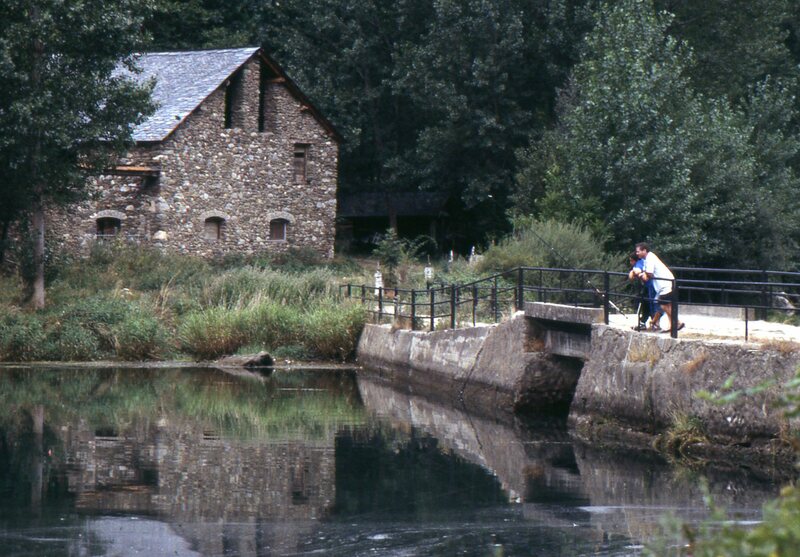 Since there was no reason for either side to come up to Aran (no river for the Spaniards to follow; a frontier stopping the French) the valley went along on its own, even developing its own language, Aranese, which is closer to Occitan, or Provencal (spoken in southern France) than it is to the Catalan spoken in this region of Spain. While the folds of the valley are now sprinkled with ski chalets, there are still plenty of vestiges of the old mountain life. We opted to stay in Salardu, probably the loveliest of the Aran villages. It’s big enough to have a few shops, cafes and lodging spots (including refuges for hikers), yet far enough from the skiing to be absent of modern buildings. We bumped along streets so tiny that I felt I could reach out and touch walls on both sides—while driving! We finally secured a suite in the Pension Aiguamog, a family-run place with windows that looked out and up at the 13th century Romanesque village churchyard, set over the huddle of stone houses. Many Aran villages are built around Romanesque churchyards just like this one in Salardu. On another day we maneuvered our car up a series of switchbacks past the renowned Beret ski area (a favorite of the Spanish royal family) and onto a seven kilometer dirt road for a visit to the abandoned village of Montgarri. I would have preferred to make this a hike—there was a five kilometer track along the river that looked appealing—but the light was going and we didn’t want to have to trudge back in the dark. The road was appalling. Tiny switchbacks with sudden lurches and drops; few places to dodge any oncoming cars; and rolls of dust coating the car. But we made the traverse all right, rolled through a handful of tumbling cottages, and emerged at a riverbank with a tiny bridge, a solid stone mountain refuge hut and an old 16th century church that was a shrine to a forgotten saint. After the dust and heat it was lovely to soak our feet in the stream, and we even got in a further hike along the riverside track. 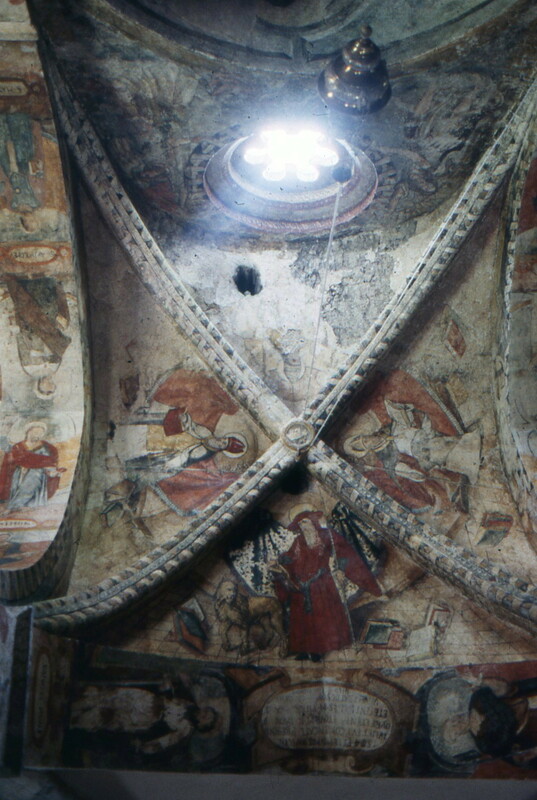 High in the mountains above Spain’s remote Aran Valley sits this 16th century shrine with its stunning frescoed ceiling. There are plenty of other excursions in the Aran Valley. Many are hikes up into pristine woods and lake-strewn valley bowls. (A variety of mountain refuges cater to overnight hikers.) 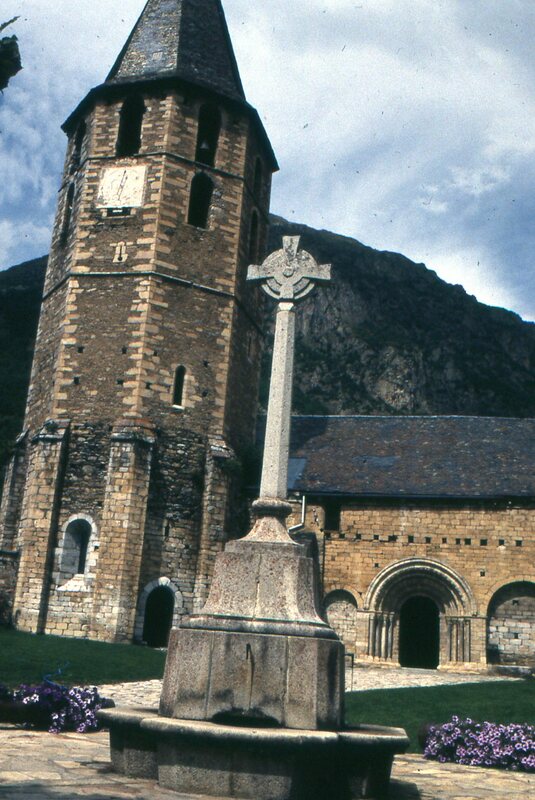 But the valley is also notable as home to a series of fine Romanesque churches. These are not built on a grand scale, but rather to serve a small local community—yet each offers a unique feature, whether its entrancing setting, or elaborate carved entryway, or delicately frescoed ceiling. Later, back in the darkness of Salardu, we went out walking in the little town: quiet, sleeping sidestreets in the moonlight; the mountains embracing the town. In the little “Plaza Major” we sat on a bench and watched the village kids play hide-and-go-seek (arguing rules and winners just like our boys would). Around the old stone water trough they went, back behind barrels and across the steps underneath the one open cafe/bar, with giggles and shrieks punctuating the still mountain air . . . an idyllic moment indeed. Originally published in Transitions Abroad, Mar/Apr 2004. This entry was posted in Uncategorized and tagged Daniel Gabriel; Minnesota author; Spain; Val d'Aran; Aran Valley; frescoes; abandoned churches; Aranese; Garonne River on April 12, 2017 by danielgabriel.